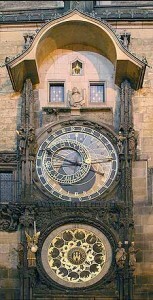 The astronomical clock is quite unique work of art and technology at the south side of the Old Town Hall. It was constructed by the clockmaker Mikulás of Kadan and the astronomer Jan Sindel around 1410. Reconstruction of the astronomical clock was done by M. Hanus z Ruze. Above the astronomical clock there are two windows, which open themselves every hour and all twelve apostles show themselves two by two in the windows. On both sides of the sphere are also movable sculptures. A skeleton rings a bell, turns over an hour-glass and nods at a Turk. The Turk shakes his head, explaning he does not want to go with him. Greed weighs his purse in his hand and Vanity admires himself in a mirror, both while nodding contentedly. Orloj’s lowest part is a zodiac calendar. In the middle is the coat of arms of the Old Town and around this turns a triple circle. According to this picture one can determine the day and the month.